Having eaten at Eviva Taverna I discovered, to my disappointment, that they followed me on Twitter. The more followers the better you may think? Not universally true. For example, if I was going to give them a particularly bad review it wouldn’t be ideal. And unfortunately that’s just what I’m about to do. A friend from London was in town for the weekend and selected Eviva from a few options of places I’d never been. The location near the arena means I am sure they snare a few pre-show diners. To say the decor is tired would be an understatement. As you descend some relatively precarious stairs you enter a space that where plastic grape bunches and check table cloths are order of the day. The restaurant too can only be described a dingy, it certainly doesn’t make for stunning images of the food with my camera phone. The menu sees the Greek classics available under the a la carte as well as a number of mezze options. So as to avoid the inevitable difficult choices we opted for the King’s Mezze which was £22. A traditional Greek salad started the procession and already suspicions were raised. The majority of this seemed far from ‘traditional’, white onion, iceberg lettuce and red cabbage making up the majority of the salad. Meatballs and vineleaves were next up and a theme emerged for the evening. Cinnamon. I don’t mind a bit of bark, and it is a regular constituent of Greek cuisine, but everything here was too heavily seasoned with it. The vineleaves, were passable but not very exciting, meatballs had been overcooked to a dry crumbly orb. Halloumi and Lounza Ham was a couple of unrefined slabs of cheese and gamon-style meat. Apart from being one of the saltiest things I have had for some time, the halloumi was particularly rubbery. A fish platter was actually a mixed bag, prawns were perhaps the best thing Eviva had to offer. They were slightly more modest than I expected as “tiger” had been announced on the menu but they were cooked well. Whitebait was ok too but the calamari, one of my favourites, left a lot to be desired. The rings of it were lightly breaded and as a result it was limp and chewy as well as drastically under seasoned. I would be very surprised if these were fresh. Moussaka was a hefty wedge of food. The lamb mince was very similar to that of the meat balls. That, now familiar, cinnamon flavour here was at least broken up some aubergine and heavy white sauce. In fact I was longing for some iceberg lettuce freshness by this point. The parched flesh only continued with a mount of various grilled kebab chunks and a sausage that I hope I never have to taste again, the closest descriptor I can think of would be an acrid pepperami. We rounded off the savoury courses with a Stifado that was a fair bit better than a lot that had gone before. The slow cooked beef in the stew was nice and tender and for once cinnamon was used sparingly, the only downside was that the gravy of the sauce was quite thin. It was all too easy to suggest that the handful of fresh fruit for dessert was the course of the evening Either way it was sweet relief really when the experience came to an end. My friend described it as one of the worst meals he could remember, I struggled to disagree with this from my own point of view. Presentation across the evening hardly supported their cause, a couple of dishes passed muster but many were poor. The quality of the cooking was such that we were under suspicion that microwaves/freezers had done as much work as the chefs. Clutching at some positive straws; I was pretty full by the end of the meal, even with having left some of the more dubious offerings. The service was pretty solid and cheerful and I got the impression it was a family-run affair. Eviva reminds me of the laziness and complacency of a small-town restaurant that a small number of regular customers just about help to keep going. It has certainly been left behind by other restaurants in Nottingham. 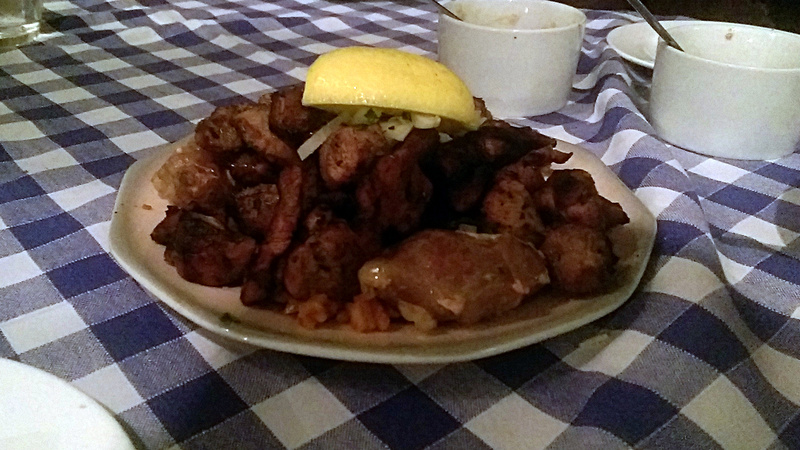 Yamas, in my experience, is better in almost every way if you are looking for a good Greek meal in Nottingham.